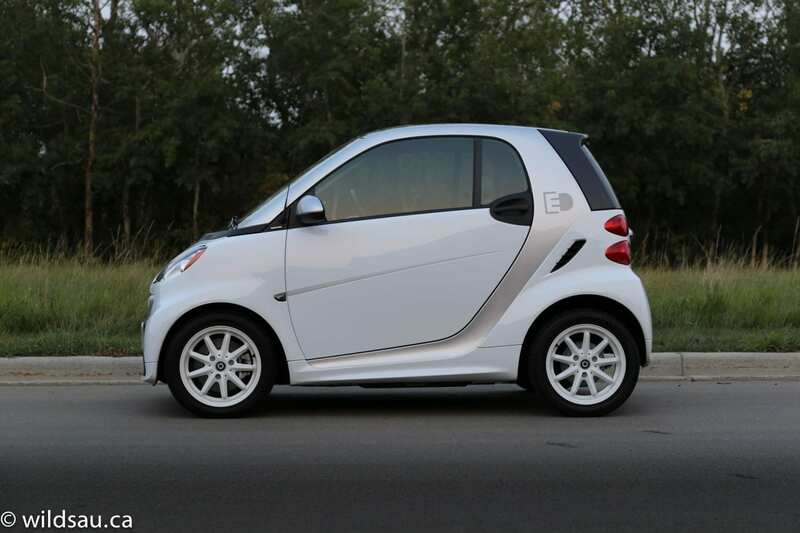 A Smart car that’s smart. 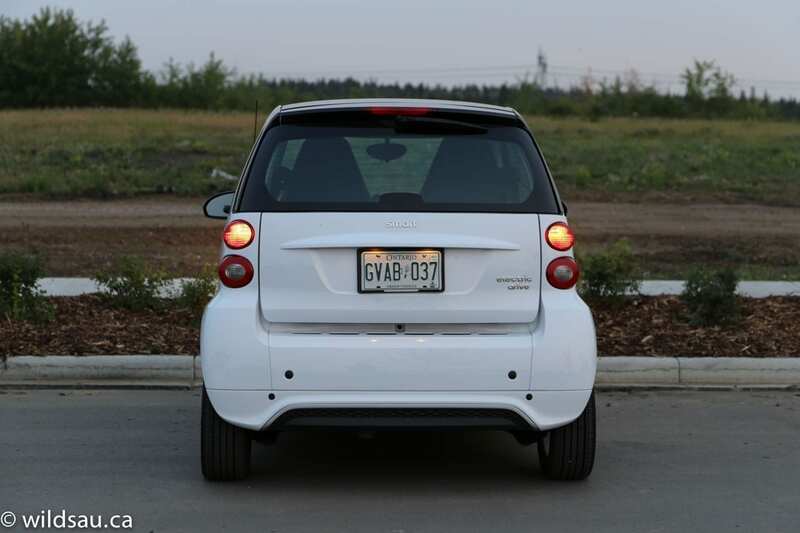 Smart calls this car the fortwo electric drive, but they shorten electric drive to an acronym (ED) on the side of the car and in some of their literature. Now ED doesn’t always have the most positive connotation in my books, and I was fearing that driving an electric car from smart could be the automotive equivalent of erectile dysfunction. I’m here to tell you it wasn’t a limp experience at all. 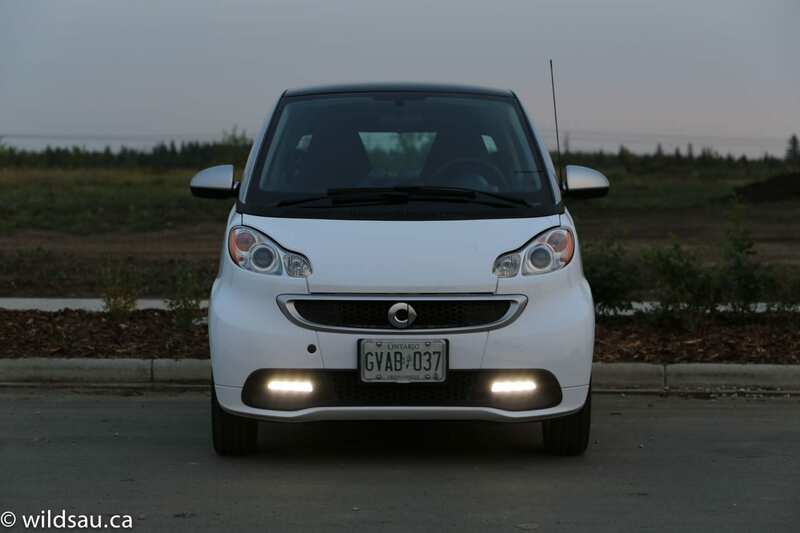 While the fortwo has received some mildly revised body work, the car obviously remains instantly recognizable. The fortwo’s body panels are polymer – yes, you can deform them by pushing on them gently with your hand just like the Saturns of yesteryear. However, you can see the metal safety cell, which is highly engineered and structured to keep the driver and passenger safe. There’s a front “hood” – it simply pops off and hangs there from a nylon strap – to access vehicle fluid reservoirs. Try as I might, I could not get that panel to pop back into place properly after I opened it. 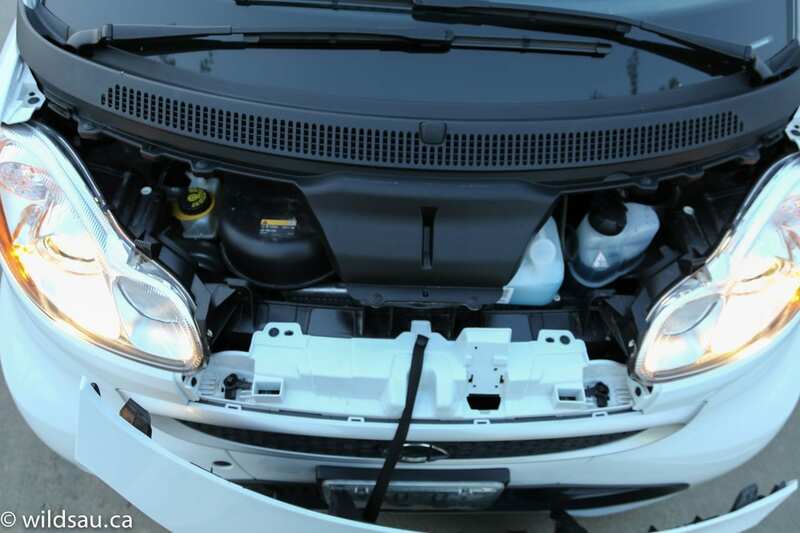 You can see the misalignment in my headlight picture – consider that user error on my behalf, not a car fault. 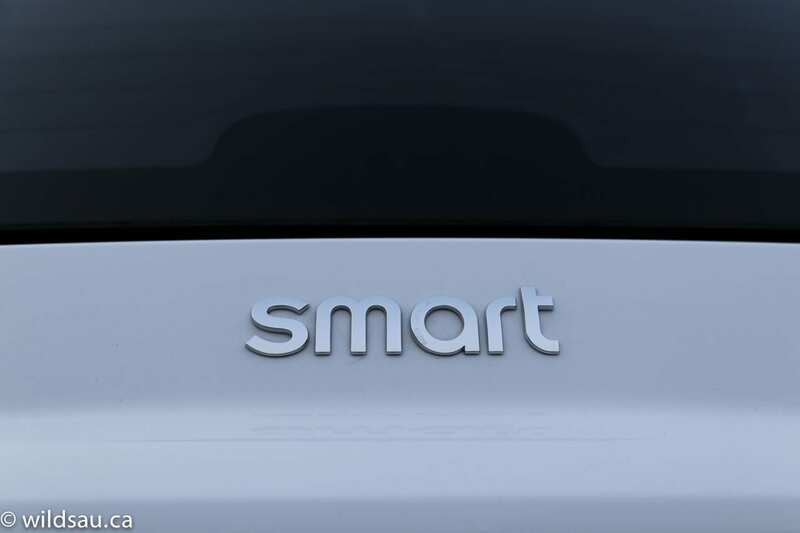 There’s no getting around the tallish design, though it’s just an illusion as the smart is actually a relatively short car, height-wise. It’s just that much shorter in length than virtually anything else out there (2.69 m! ), and that gives it a taller appearance. 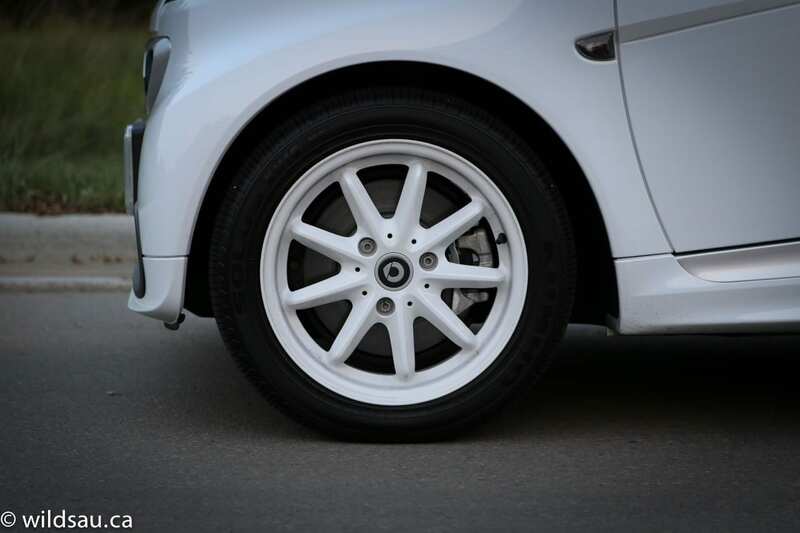 Up front, it gets signature LED driving lights and a handsome set of white 15-inch rims complete the package. 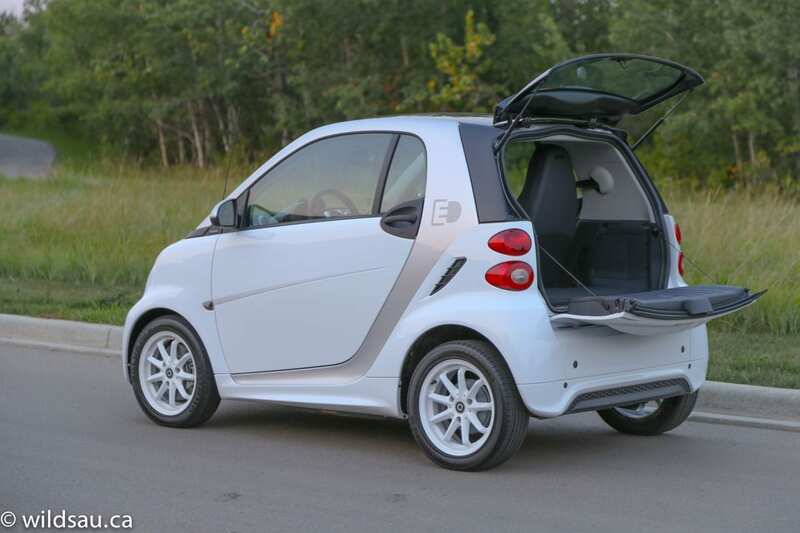 The fortwo feels remarkably spacious inside, and once you’re in, it’s easy to forget the actual external dimensions of the smart fortwo. Fit and finish leans toward entry level. 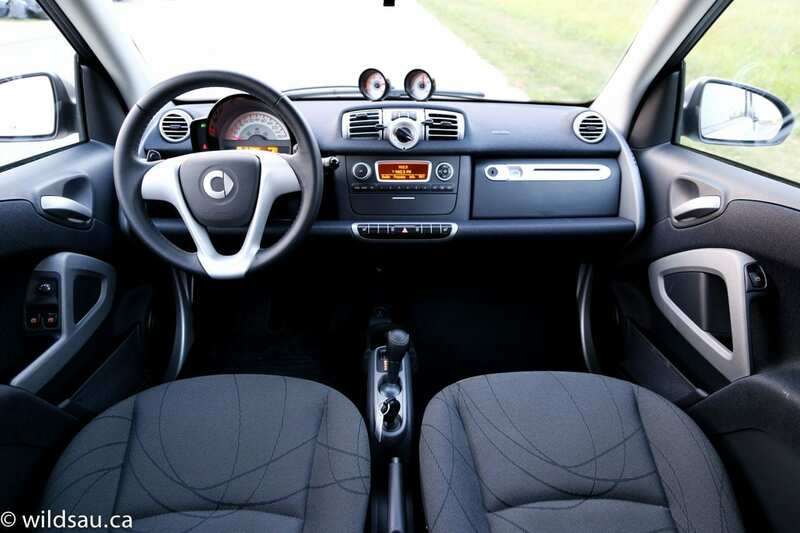 The plastics and textures feel cheap, the fabric on the dash gives the interior a strange rental-car/hotel lounge aura, there are plenty of sharp edges and interesting gaps between some panels, and to top it all off, there is a large exposed bolt head under the dash. 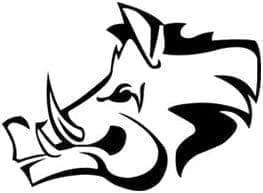 The whole thing is simple, straightforward, basic and none too pretty – but somehow it all works. 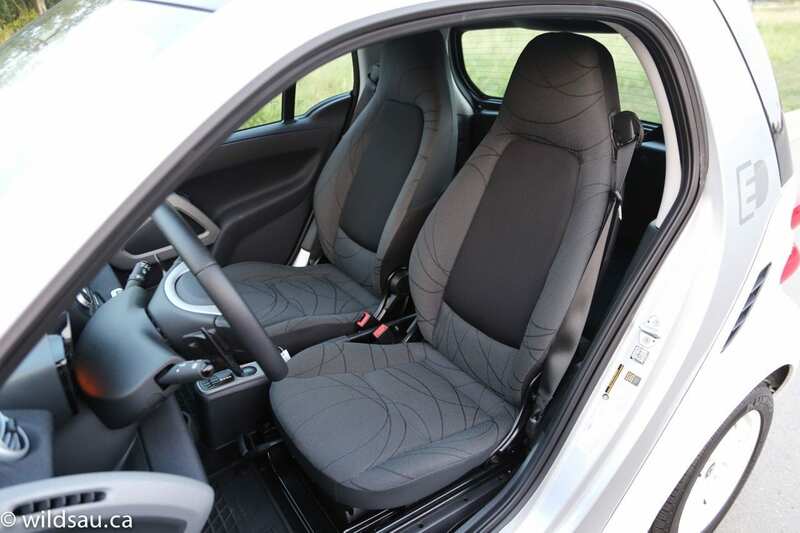 The smart’s fabric seats are heated and quite comfortable, but are not very well bolstered. Perhaps this is smart’s way of telling us to take it easy around corners? We’ll see. Straight ahead is a speedometer and a very crunchy-looking amber monochrome driver information screen. 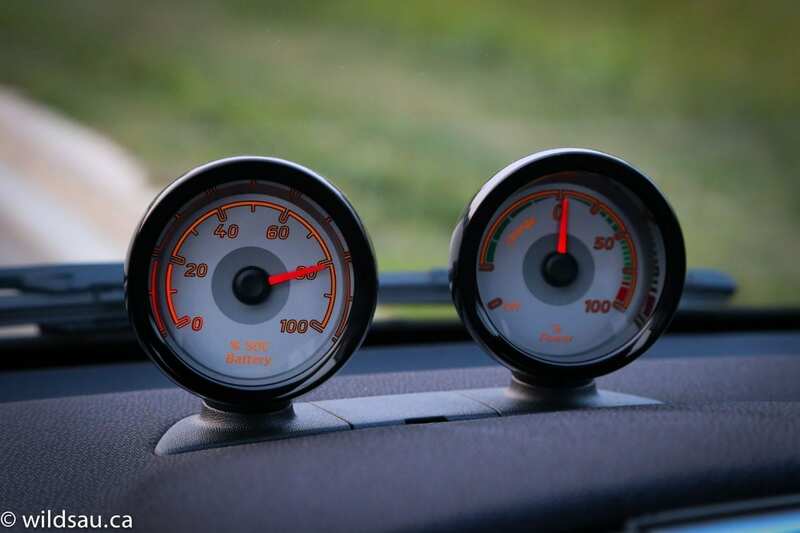 Centrally mounted on top of the dash are two gauges – one for battery capacity and one for current energy usage (in percentage). 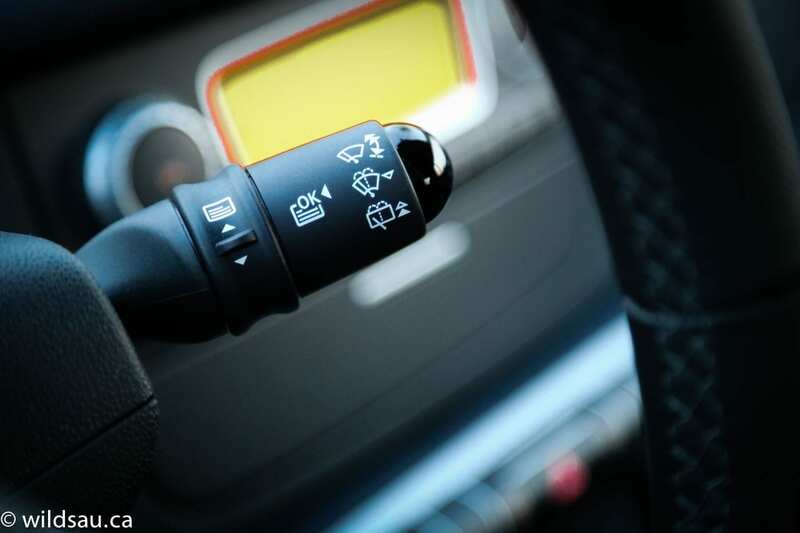 There’s a manual climate control system – it works well, but the fan is irritatingly loud, even at the lowest setting – and a stereo system with an interface that feels like it is a couple of decades old. It feeds from AM, FM, USB and auxiliary sources. There’s no centre console, but you’ll find a couple of cupholders, the “gear” selector, the ignition and a parking brake lever between the seats – there’s also a 12V plug under the dash. 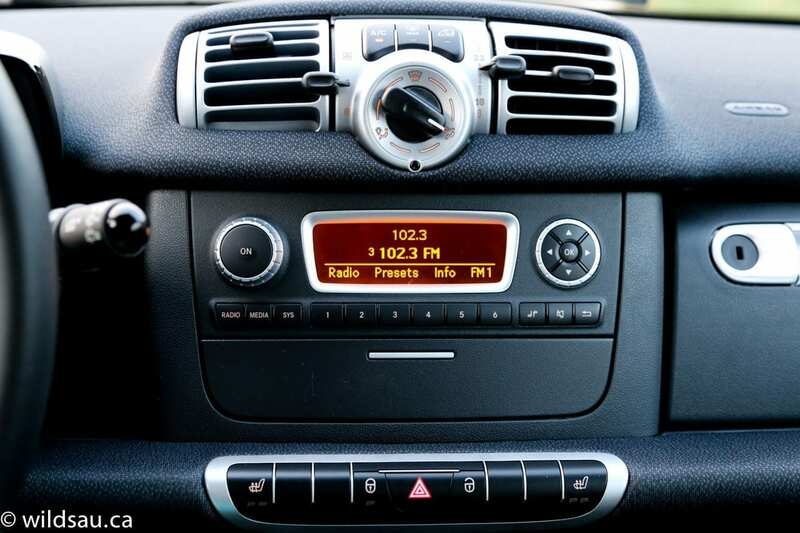 I’m not sure if it’s an option, but I do not believe this car had any Bluetooth capability – this is the first vehicle I’ve not been able to connect my phone to in about 4 years and I find that unacceptable in 2015. I’d love to find out that I was just blind and couldn’t find the Bluetooth feature. I loved the large fixed panoramic roof overhead – it’s essentially the entire roof panel and it has a manual sunshade if things get too bright. In a vehicle this size, every bit of storage matters. Between the mesh pockets in the doors, the slide-out drawer below the stereo, the large open drop-in bin on the left side of the dash and a reasonably-sized glove compartment, it does pretty well. Behind the seats is an easily accessible trunk. You can reach behind you to throw something in or get something out – it’s right there. Of course you can pop open the glass from outside and if you need full height access, you can drop down the tailgate. 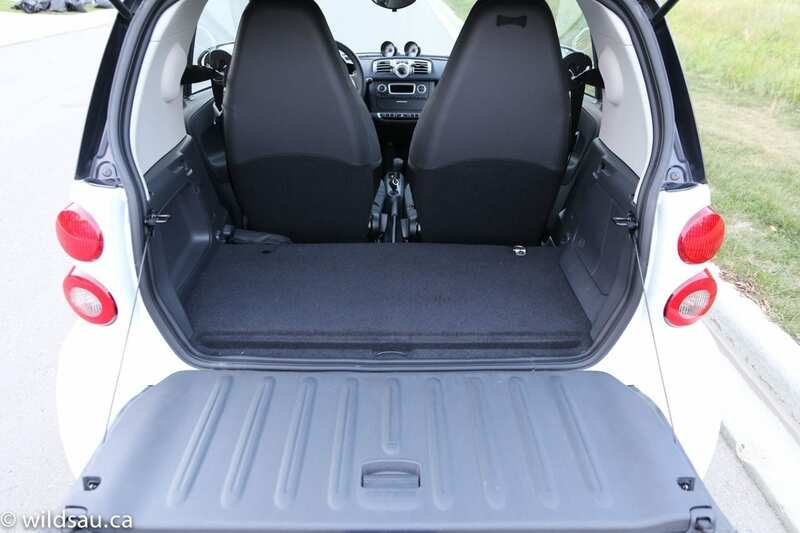 Obviously it’s not big, but it’s surprisingly roomy (340 litres) versus what you might expect judging by the fortwo’s exterior. 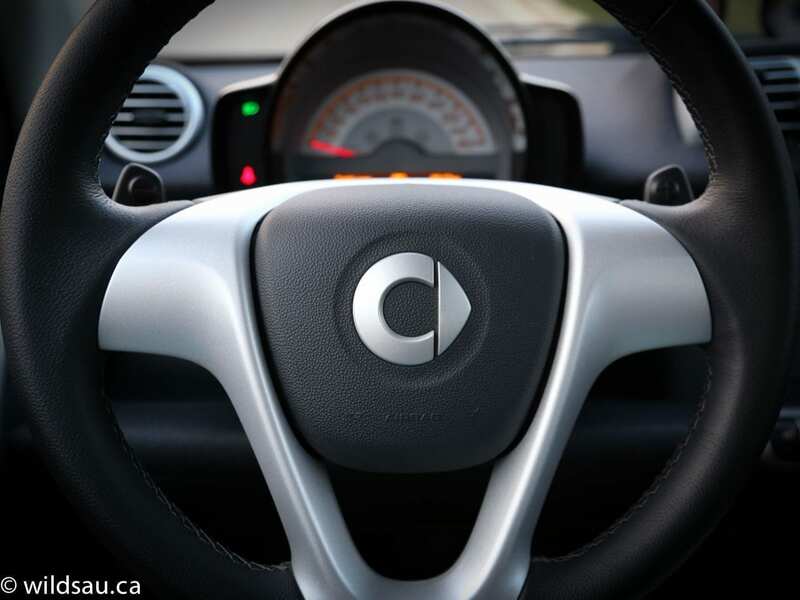 The fortwo electric drive’s powertrain is a 74 hp, 96 lb.ft electric motor. 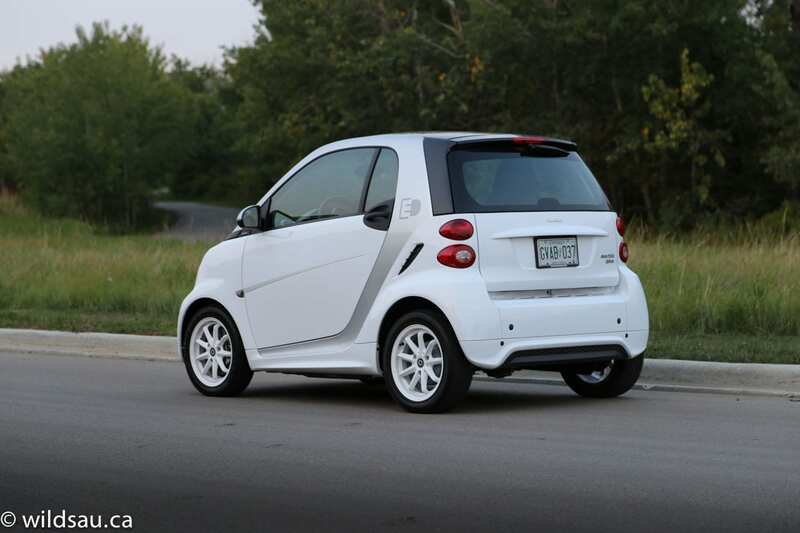 Many are surprised to find out that smart cars are rear-wheel drive. The car comes with a Level I 110V household plug charging cable which fits snugly and securely into the tailgate for storage. Charging time is slow with this cable (16 hours from empty), but totally fine for topping off the battery after short commutes. If you bump it up to the more powerful Level II 240V charging equipment, smart says it takes about 6 hours for a full charge from 0%. 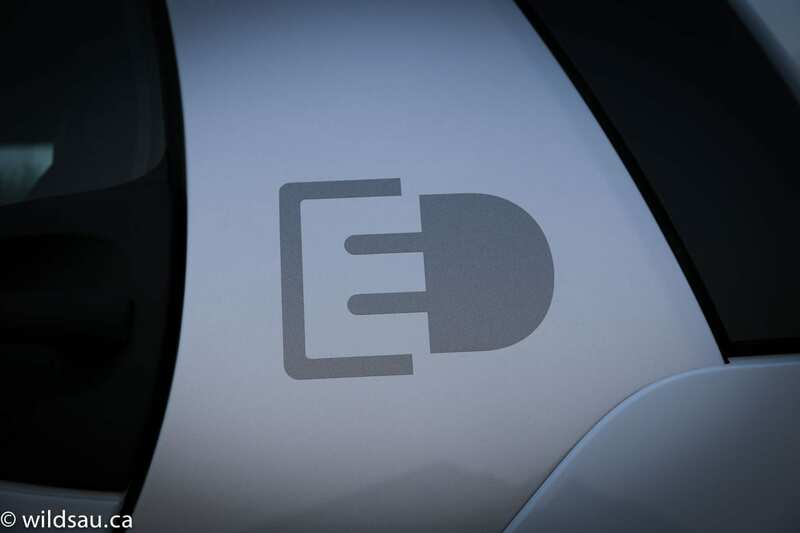 When it’s plugged in, the fortwo ED allows you to charge immediately, or delay your charging for a later time, in case your electricity costs are lower at different times. 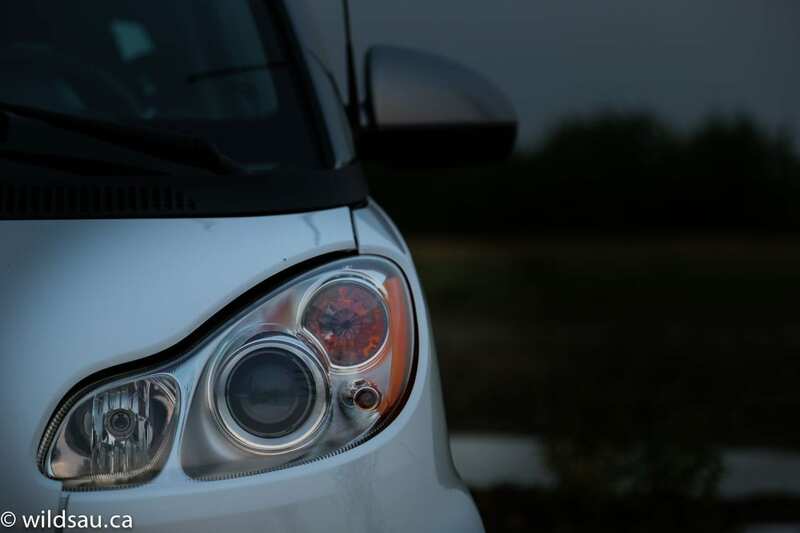 The official range of the fortwo’s 17.6 kWh lithium-ion battery is 109 km. My typical commute is about 21 km total there and back – it’s relatively slow going, occasionally bumper-to-bumper, occasionally moving along at a reasonable clip but never exceeding 60 km/h. I almost invariably used between 20-25% of the battery capacity for my daily. Theoretically then, I could drive for about four days without charging the car. 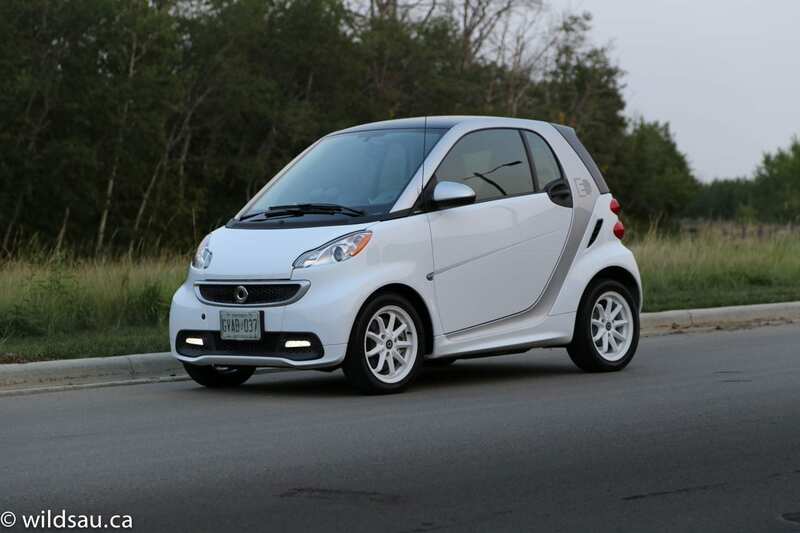 When I was on the highway, the smart was often using about 50% of its power or more just to maintain highway speeds, and it drained the battery much more quickly – approximately 50% battery capacity used after 35 minutes on the highway. I’ve driven smart cars in the past and frankly, I’ve never been impressed by the driving experience. 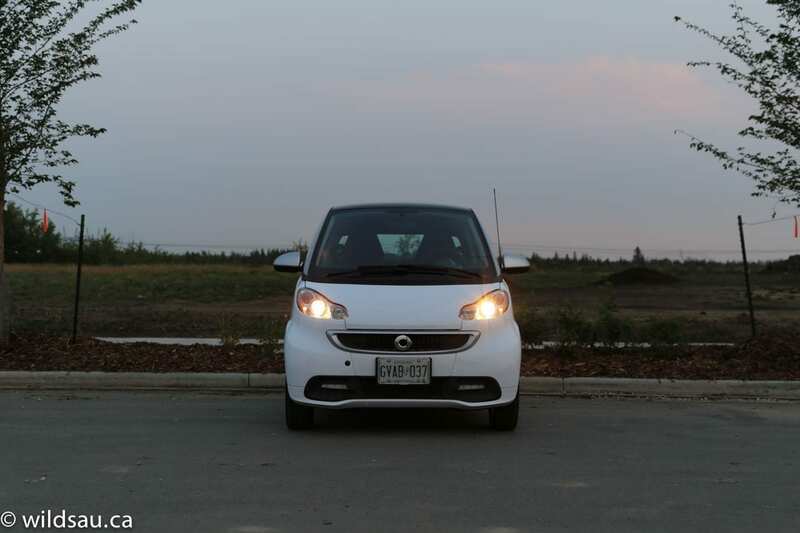 The fortwo electric drive redeemed the brand for me. While the numbers aren’t impressive, they are plenty for a vehicle of this size. The electric drivetrain is surprisingly responsive off the line (0-60 km/h in 4.8 seconds) and provides very linear pull up to about 80 km/h at which point acceleration slows down a bit. With that said, I had it up to 130 km/h on the highway (even though it says the maximum speed is 125 km/h), and it holds its own. It takes a few seconds to get there, but it’s not horribly slow. 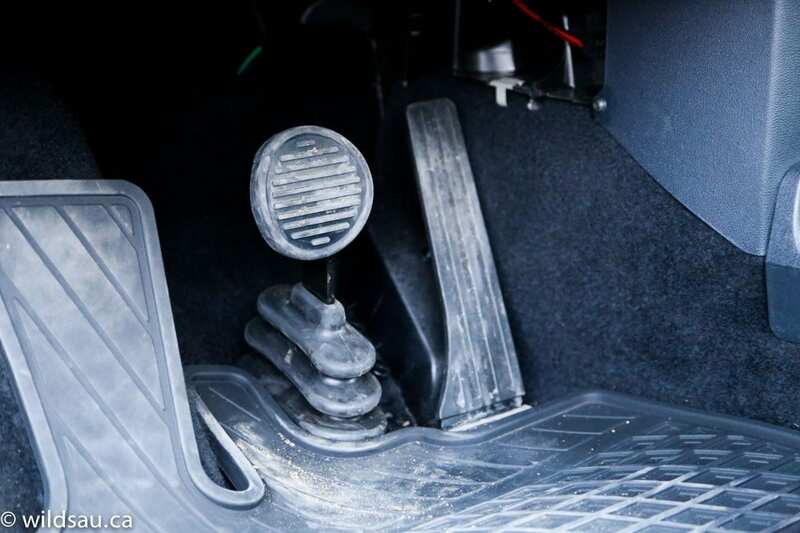 When you take off from a stop, normal use of the accelerator pedal accesses about 75% of the motor’s power. 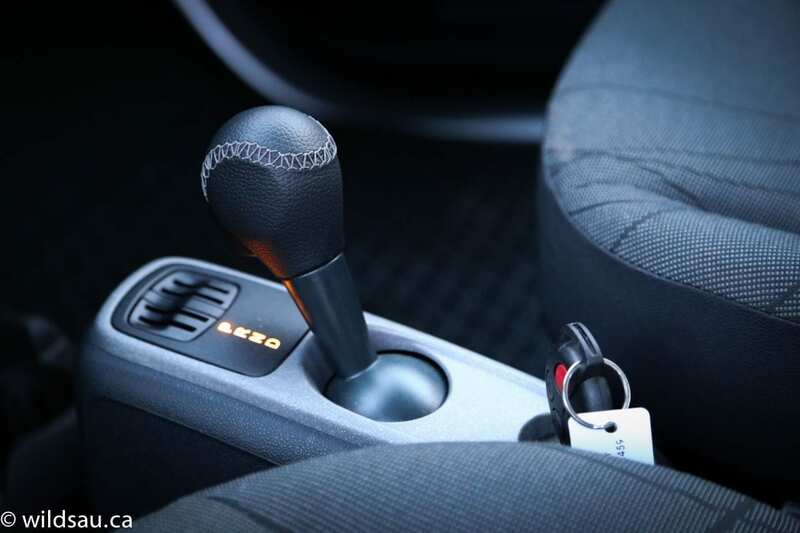 If you want to tap all of it, there’s an extra detent at the end of the pedal’s travel – push through it, and the little car surges ahead as the energy usage needle swings up to 100%. I found the acceleration to be excellent around town, and it’s ideal for a little urban commuter car. To be honest, I think I surprised a few people (passengers and drivers next to me at red lights) with its get-up-and-go. Recuperation paddles, as smart calls them, that essentially increase the electric motor’s resistance, allow you to regenerate energy to charge the battery and use the resistance as an electric car’s version of engine braking. It’s pretty handy around town. Speaking of regenerating energy, the brakes are terrible on this car. The pedal effort is very heavy, and the brakes are very spongy at first, then become ultra-grabby once you get your foot into them. 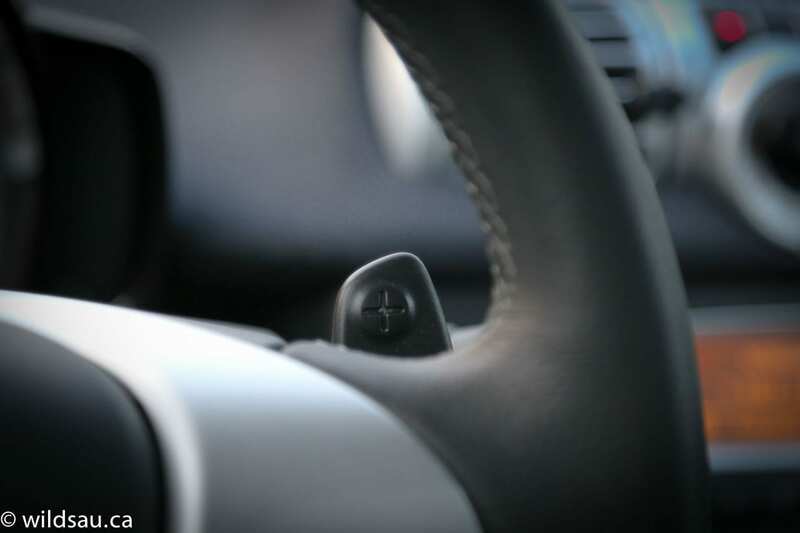 Handling is acceptable, especially around town at lower speeds, but when you’re on the move, the vehicle always feels tall and definitely leans any time you head into a curve or corner. I was a bit surprised at how heavy the steering effort is though I didn’t mind that at all. The ride is firm but comfortable. I found the car got quite hoppy on the highway, thanks to its short wheelbase, but it always remained stable including one evening when I had to deal with some serious cross-winds. Visibility out of the fortwo is fantastic – a great view of the road ahead and out of the sides, and of course, shoulder-checking is … well, just looking over your shoulder. 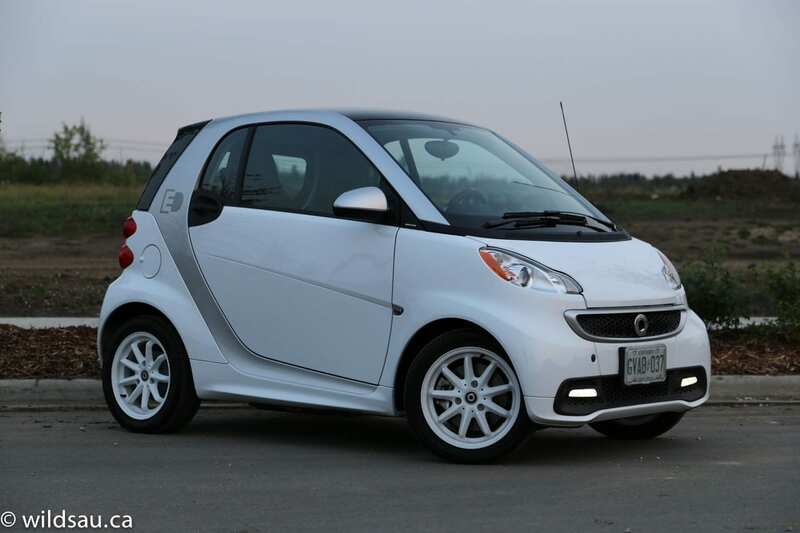 So who is buying smart fortwos? Well, to be honest, I don’t know. But I can tell you who should. 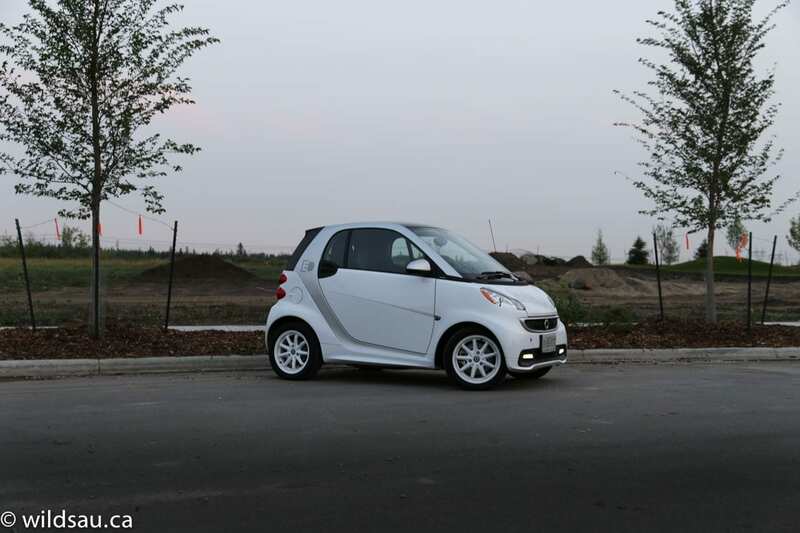 If you’re looking for a solid little urban commuter, the smart fortwo ED is a fantastic option. I’m surprised to find myself writing that, but it really is. It has all the power you’ll ever need in the city and it has room for two as well as cargo space to accommodate a decent grocery trip. You’re obviously not going to do a family-sized trip to Costco in this thing and I don’t think it would be a great road trip vehicle. But in an urban setting, it manages to do a great job in getting the occupants from point A to point B – in comfort, in safety and with incredible efficiency. It’s not cheap, but if you live in a province that doles out rebates for alternative energy vehicles, the car’s price becomes much more palatable. The looks aren’t for everyone, but if you can get past that, I have no issue recommending this as a solid alternative if you need something to get you to work and you’re wanting to give an alternate energy source a try. 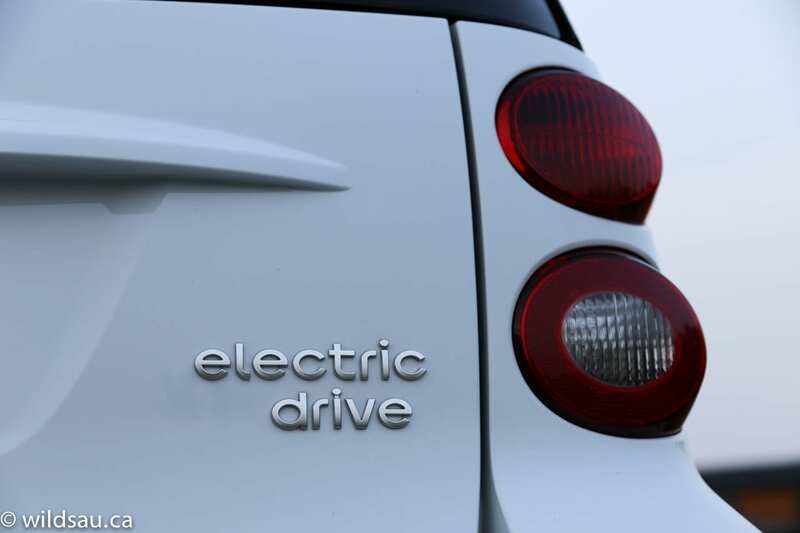 As nifty as the smart fortwo electric drive is, keep in mind that you could add a few thousand dollars to the pile and opt for a Kia Soul EV, a remarkable electric vehicle that, for me, required very little compromise. That’s the EV I’d buy if I was in the market.